You’ll find that rooms at the Loews Royal Pacific are based on a tropical paradise theme – and are the perfect base for an Orlando holiday. 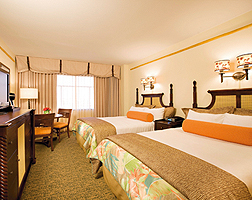 Standard rooms are the ideal place to relax after a long day at the nearby Universal theme parks, with one king or two queen sized beds, a sitting area and smart heating, to keep your room cool even in the Florida summer! There are also flat screen televisions, coffee makers, iPod docking stations and an in-room safe in every room. Guests can choose to upgrade to a Club Level Room, which includes all of the wonderful amenities of the Standard Guest rooms along with some added extras, such as in-room bathrobes, personal concierge and access to the Club lounge, where complimentary breakfast, snacks and pre-dinner drinks are all available. Suites are also available at the Loews Royal Pacific; from roomy King Suites for those travellers who just need a little extra space to the amazing and unique Kids’ Suites for families. The Jurassic Park Kids’ Suites include a king bedroom for the adults, while kids will love the separate Jurassic Park themed twin kids room which opens onto mum and dad’s! The King Suite is the perfect place to entertain friends whilst you’re in Orlando – there’s even a pull-out sofa bed in case you need a little more sleeping space!